YALETOWN LAUNCHES CANDYTOWN--A FREE OUTDOOR CHRISTMAS FESTIVAL NOVEMBER 23-24. It’s beginning to look a lot like Christmas. Everywhere you go. But let’s focus on Yaletown. 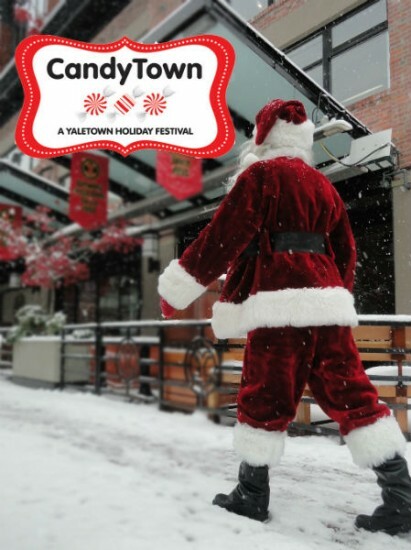 Yaletown launches Candytown – its first ever Christmas festival – Nov. 23-24. Candytown also happens to be the only free, outdoor Christmas festival in downtown Vancouver. So get involved. Candytown will transform Vancouver’s former-warehouse-district-turned-trendster-hood into winter wonderland: twinkling lights, lamp posts re-imagined as giant candy canes, Christmas characters greeting you as you stroll Mainland, and more. The nice thing about Candytown is that it was organized with all ages in mind. There’s something for everyone at the festival. Families can get excited about Santa, live reindeer at Santa’s reindeer barn, and horse-drawn carriage rides. 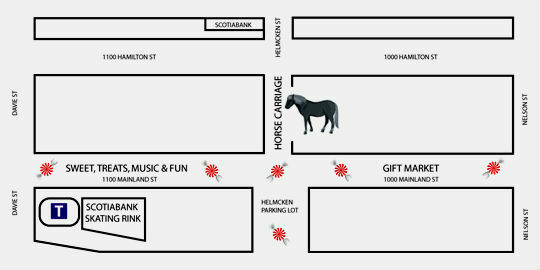 I’m already aflutter about the free Scotiabank Ice Rink at Bill Curtis Square. Hockey fans have the chance to meet Trevor Linden; the NHL legend will visit the ice rink for skating and signatures. Adult revellers can look into the Candytown Cocktail Tour – a boozey trail of candy-themed drinks at participating Yaletown restaurants. It is Christmas, which does tend to mean gifts. Of course there will also be an All I Want for Christmas Street Market for holiday gift shopping as well as purchasing seasonal treats to eat as you browse. Find details on where and when the festivities go down after the jump. Candytown, Yaletown’s first Christmas festival, is free and open to the public. The festivities take place on Mainland Street between Davie Street and Nelson Street.